Have you ever heard the normally reticent FabIndia ishaving a sale? Well, they are and it is in a big warehouse below their flagship store on CMH Road. 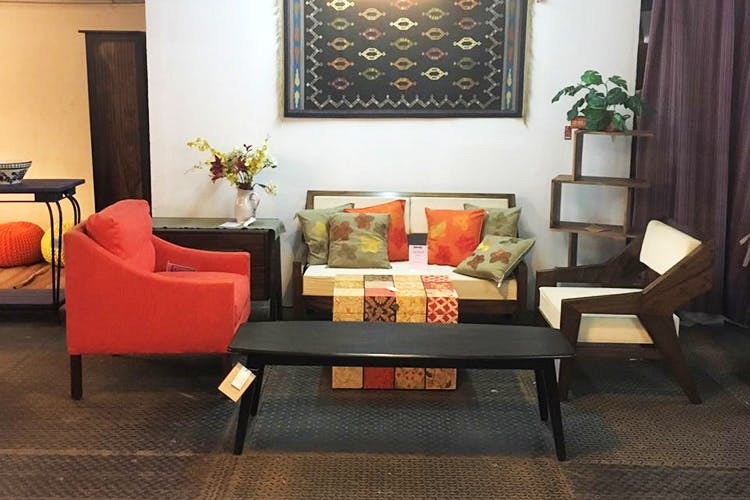 And they are offering discounts of up to 30 per cent on their existing furniture collection and some home decor. Hurry, because the sale is on only till stocks last! The warehouse is pretty massive, and as you enter you will spot furniture arranged according to rooms in a house. So there are sofa sets with coffee tables to pick from, even King and Queen size beds complete with side tables, and dining table sets. But what we think you should actually check out are some offbeat seating options like long benches, garden chairs, and individual upholstered seats. We also spotted a funky painted storage box, which can double up as a centre table in your living room. There are also lamps, serve ware, cushion covers, picnic tables, table linen and storage boxes and baskets available to be picked. And everything displayed is on a discount of upto 30 per cent.